Cian Lynch in action for the Limerick U21's on Sunday. CIAN LYNCH IS the sole member from the Limerick senior hurling squad that lost to Dublin last Saturday in the county’s U21 team for tomorrow’s Bord Gáis Energy Munster semi-final against Tipperary. Lynch is named at corner-forward in an attack that includes three other players from last year’s Limerick side that reached the All-Ireland minor final in Robbie Hanley, Ronan Lynch and Tom Morrissey. Wing-back Gearoid Hegarty was part of the Limerick senior football team this year while corner-forward Kevin O’Brien won a Fitzgibbon Cup medal with UL in March. Throw-in at the Gaelic Grounds is 7.30pm. Email “Lynch the sole senior panellist in Limerick U21 side for Munster semi-final”. 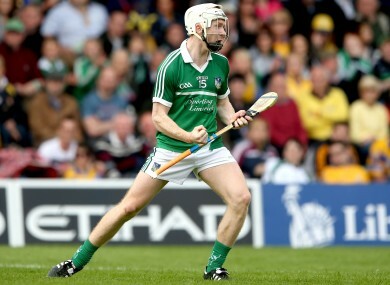 Feedback on “Lynch the sole senior panellist in Limerick U21 side for Munster semi-final”.